There is no shortage of diversity among AARCH members. They come from all corners of the country and beyond, and represent a wide variety of backgrounds and interests. It is with their support that AARCH continues its mission of promoting better understanding and appreciation of the Adirondacks’ diverse built environment. 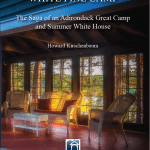 To join Adirondack Architectural Heritage as an Individual or Family Member via mail, download a printable form.